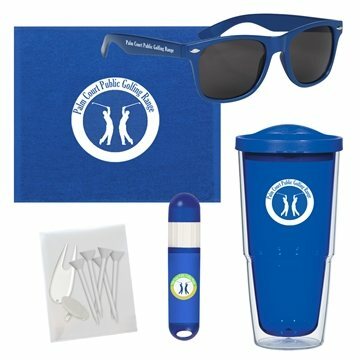 Kit Contains: - 24 oz Biggie Tumbler With Lid, Malibu Sunglasses, Rally Towel, Lip Balm And Sunstick,And A Blank Poly Bag With 5 Tees, A Divot Tool And A Ball Marker. Especially pleased with the timely manner in which AnyPromo completed the order and got it to me. Thank you so much! the product was great. All the features worked well and the graphic print was exactly like the pre-approval photo. Very trendy item. I liked both the quality and the style of the product. We got good feedback from our subscribers. It seems we chose the right product. Everything was OK. We thought these turned out much better than we projected!